Fr John Saward is Priest in Charge of the parish of SS Gregory and Augustine in North Oxford and Lisieux Senior Research Fellow in Theology at Greyfriars Permanent Private Hall of Oxford University. In his earlier life he studied Philosophy and Psychology at St John’s College, Oxford, trained for Anglican orders at St Stephen’s House, Oxford, and was Chaplain of Lincoln College, Oxford. He was received into the Catholic Church in 1979, and after many years teaching theology at Catholic institutions, including the International Theological Institute at Gaming, Austria, St Charles Borromeo Seminary, Pennsylvania, USA, and Ushaw, England, he was ordained priest in 2003. Over the years he has published numerous books and articles, notably Redeemer in the Womb (1993), The Way of the Lamb (1997), and Cradle of Redeeming Love (2002); he was also the English translator of the Holy Father’s Spirit of the Liturgy (2000). He is married with three grown-up daughters. There are pages giving his CV on several websites; the most complete appears to be the Gaming one; he also has a Wikipedia entry. 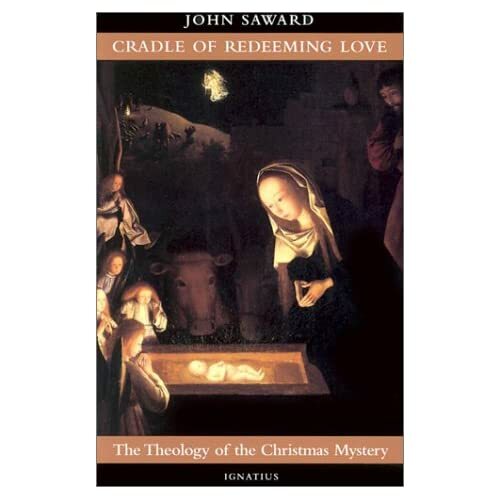 Fr Saward has not only a very serious academic interest in the liturgy (a current project is a ‘A spiritual commentary on the Roman rite of Holy Mass’, to be called Catena Eucharistica; something to look out for), but he has long celebrated the Traditional Roman Mass as a private devotion. 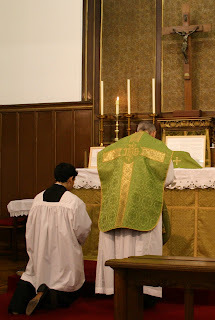 When I became the local representative of the Latin Mass Society in 2005, I saw that he was a member; as assistant priest at SS Gregory and Augustine’s, he suggested celebrating regular First Friday Masses; it was not long before it was established that these would be sung in Term time. These have proved to be a staple for local singers wishing to participate in the Traditional liturgy. Since becoming Priest in Charge at that church, we have had Gregorian Chant Training days there, and regular Low Masses on Wednesdays. 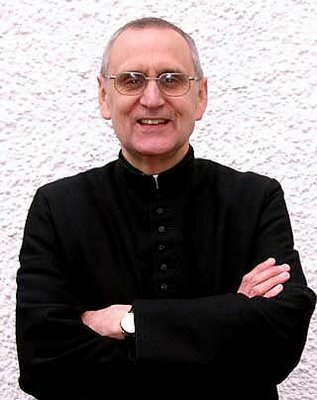 He has also extended the use of Gregorian Chant at his regular Novus Ordo Sunday Masses, with the assistance of the remarkable Dr John Caldwell, a musicologist and composer who is also the organist and director of the parish choir. As advertised in advance on the NLM, he gave a talk this week to the Oxford University Newman Society on the Holy Father’s Motu Proprio Summorum Pontificum. 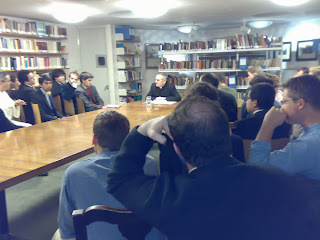 He spoke to a capacity crowd in the Catholic Chaplaincy’s library, in the presence of the Senior Chaplain, Fr John Moffat SJ, several Dominicans, and me. In what follows I summarize his talk. He began by noting that he was not (thank heavens) a ‘liturgist’, so would be talking about the dogmatic, not simply liturgical or indeed church political implications of the MP. The starting point of a dogmatic approach to the MP is St Thomas Aquinas’s remark ‘sed contra’ to objections to the rituals of the Mass (ST IIIa q.83 a.5 sc): ‘The custom of the Church stands for these things: and the Church cannot err, since she is taught by the Holy Ghost.’ (Sed in contrarium est Ecclesiae consuetudo, quae errare non potest, utpote spiritu sancto instructa.) It is not just the propositional statements of the Church which, when they have the appropriate degree of authority, can be relied upon as guided and guaranteed by the Holy Ghost, but the customs of the Church. What is practised for long ages by the most universally revered authorities cannot suddenly be said to be defective. This is exactly the point made repeatedly by Joseph, Cardinal Ratzinger in his books, and which is repeated clearly by Papa Ratzinger in his Letter to Bishops accompanying the MP. What was holy yesterday cannot be harmful today; indeed, the denial of this principle ‘calls the very existence of the Church into question’ (Feast of Faith). It is for this reason that it must be understood that the previous liturgical tradition was never abrogated. This is a dogmatic matter, and in making this dogmatic point the Holy Father is doing what he always does in the exercise of his office, which is guarding the Faith. It is in this light that we can understand the recent remarks by Archbishop Ranjith, who is working closely with the Pope on this matter, that the liberation of the Traditional Mass is a condition for the renewal desired by the Second Vatican Council. Respect for tradition is the basis for Catholics’ search for truth. 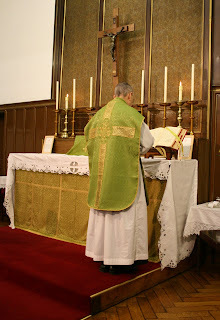 Fr Saward then gave a series of examples in which the teaching of the Church, revealed and made vivid by the Traditional form or the Roman Rite, as other ancient Rites, is obscured in the Missal of Paul VI. First, many of the orations of the 1962 Missal are addressed to the Second Person of the Trinity, and two prayers, the Suscipe, sancta Trinitas at the Offertory and the Placeat tibi, sancta Trinitase are addressed to the whole Trinity, despite the fact that the majority of the orations and other prayers use the familiar form of addressing the Father through the Son in the Holy Ghost. This twofold pattern of liturgical prayer reflects and makes manifest the Catholic dogma of the Holy and Undivided Trinity. The 1970 Missal removes almost all of the orations addressed to the incarnate Son and both of the prayers addressed to the whole Trinity. These amputations from the liturgy open the way to misunderstanding. Participants in the liturgy are no longer reminded of the co-equality and consubstantiality of the Persons of the Trinity. This is not a merely theoretical point since a whole series of Trinitarian and Christological errors, tending to the denial of Christ’s Divine nature and co-equality with the Father, have been condemned or censured by the Holy See in recent decades (cf the cases of Edward Schillebeeckx OP and, more recently, of Roger Haight SJ). A second example, mentioned by the then Professor Ratzinger in his textbook on Eschatology, is the disappearance of the word anima, ‘soul’, from the reformed liturgy of the dead and elsewhere. Prayers addressing the soul of the dead man or woman to be buried are replaced or adapted to refer to God’s ‘famulus(a)’, God’s servant or handmaid. Again, there is no heresy in the new prayers, but the loss of the references to the metaphysical reality of the soul, and especially the soul separated from the body at death, is most unfortunate in light of theological errors on this subject, which have had to be censured (e.g. by the SCDF in 1979). A third example is the suppression, even in prayers otherwise retained, of references to the priest’s sinfulness and compunction. Do priests no longer need to express sorrow for their sins? In the cold light of day, this and the other changes enumerated seem bizarre: what positive reason could be adduced for them? A fourth example is the ceremonial of the Mass, such as the signs of the cross, so many of which have been suppressed in the 1970 Missal. These actions had in the past given rise to a whole genre of spiritual commentaries on the Mass, which assigned dogmatic meanings to the rituals with great consistency. Many saints, including St Thomas Aquinas, contributed to this literature, and took these signs extremely seriously. With the 1970 Missal, not only are these books rendered obsolete, but the signs themselves are no longer there to communicate their dogmatic significance to the onlooker. Fr Saward then turned to the Pope’s exhortation Sacramentum Caritatis, which is linked to the MP in an important way. The Eucharist is the sacrament of love, and the MP has charity as both its source and it object: not merely the reconciliation of Traditionalists to full communion with the Church, but more fundamentally an increase of faith and charity among the Faithful. The Mass is a source of charity since, as Aquinas teaches, the worthy reception of Holy Communion actualises charity, and makes the recipient ‘spiritually gladdened’. 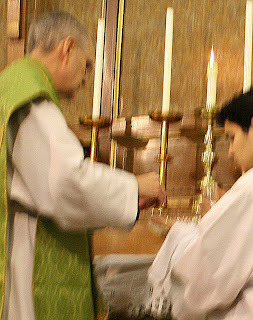 This is possible only, of course, to the communicant who is properly disposed, and to achieve this proper participation in the Mass, uniting oneself in intention with Christ the High Priest, is necessary. With this is mind, we turn to the remarkably strongly-worded critique of misleading or unhelpful aspects of the 1970 Missal found in Ratzinger’s works. In The Spirit of the Liturgy Ratzinger made an extremely strong critique of Mass facing the people, warning that such Masses could and in some times and places had become a ‘closed circle’, where attention which should be fixed on God became fixed on Man; he even likened such ‘self-initiated’ and ‘self-seeking’ liturgy to the worship of the Golden Calf: the ultimate substitution of a human artifact for God as the object of worship. In that book and elsewhere, Ratzinger noted the problem of silence in the New Mass, since for the most part periods of silence in the course of Mass were only possible by bringing the liturgy to a temporary halt. On the contrary, Ratzinger argued, to be fruitful silence needs to be an integral part of the liturgy, what he calls ‘filled silence’, and not merely an artificial pause. In these and in other ways the reformed liturgy actually militates against effective participation. In concluding, Fr Saward warned against the temptations faced by those who, like him, are ‘attached’ to the Traditional liturgy, notably pride and over-emphasis on externals. Charity, again, must be our object. To facilitate the flow of charity from our participation in Mass to our ordinary interaction, we should heed the advice of St Thomas Aquinas once more, and seek the intercession of Our Lady, always the model for the reception of Jesus Christ, and who in every danger will come to the assistance of her suppliants. The talk was followed by questions. In the course of these Fr Saward noted the paradox that the Roman Rite, long noted for its conservatism and austerity, had lost these features in its reformed form by the addition of elements from other Rites. He urged his audience to read books in preference to blogs! He noted the immense importance of the published works of Cardinal Ratzinger, over the years, in forming his own thinking and that of many others, on the subject of the Mass, and how with the MP the Holy Father’s openness to criticism of the reformed liturgy was a very liberating experience. Faithful Catholics no longer feel they must suppress doubts and worries and concerns about the reform, for they have been expressed by the Pope himself. The final question from the floor concerned the pastoral difficulty of widening the use of the Traditional Mass. There are clearly many who would, if confronted with it without further ado, find it an ‘alien experience’. One option at this point, the questioner suggested, would be to contemplate a ‘two-tier’ liturgy, the Traditional one for those who can really grasp it, and the reformed Mass for everyone else. In response to this, Fr Saward acknowledged the seriousness of the difficulty, which he had experienced himself in his own parish. However, a two-tier liturgy is not the right answer. The Eastern Churches, Catholic and Orthodox, have no special liturgy for special groups, no ‘children’s liturgy’ for example, but one Divine Liturgy which is always sung and always rather lengthy, by Latin standards. This does not seem to create difficulties for them with regard to the young, or the less educated; on the contrary, this kind of liturgical experience is something that everyone can appreciate. 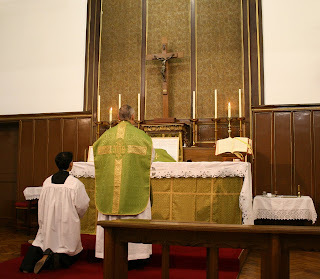 It will certainly be difficult to bring the liturgical tradition, in its fullness, back into every corner of ordinary parish life, but it must at least be attempted with the help of God. The key to liturgical formation is the receptivity of children and the capacity for wonder with which all human beings are endowed. The great liturgical tradition of the Church, East and West, has the power to touch hearts.